Keith Michaels is not the typical Binghamton professor. 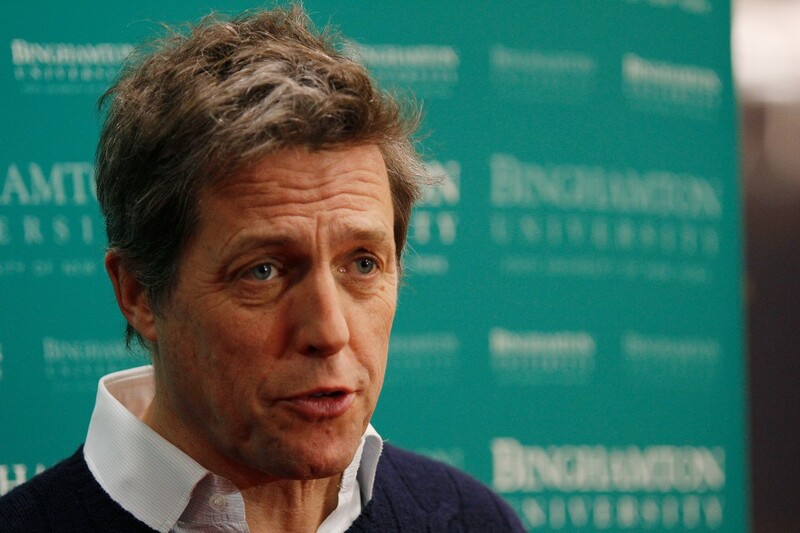 He’s woefully unqualified to teach and, played by Hugh Grant, far too handsome. Fifteen years past his professional prime as a screenwriter, he just can’t get any of his pitches accepted by studios. And no wonder — they’re all terrible. Struggling to pay his bills, he takes a job teaching screenwriting at Binghamton University, where his shallow, sexist and boozy personality quickly chafes the chair of the University’s ethics committee, and he gets into an ill-advised relationship with one of his students. He thought he had hit rock bottom in Hollywood only to find that things could, in fact, get worse. Somewhere on his quest to repair his dignity and reputation, he falls in love with another student in his class — this time, the relationship is more appropriate. She’s played by Marisa Tomei, a divorced mother with two jobs (at the University bookstore and as a waitress at Number 5), who is going back to college to get a degree. After coming to Binghamton believing that “writing can’t be taught,” Michaels learns to become a teacher. Not only a good teacher, but a great one, the sort where students compliment him on his lessons when they see him outside of class. Just as Tomei’s character is something of a late bloomer, Michaels finds that maybe the best part of his life is actually ahead of him. “The Rewrite” couldn’t have been set anywhere else besides Binghamton. The town’s character is essential to the movie. There’s a pivotal scene at the Recreation Park carousel, everyone seems to be either wearing or holding a jacket at all times and a character can reject a dinner invitation with “No, I had a spiedie earlier, so I’m not hungry,” and it works. On Sunday afternoon, Binghamton students and residents finally got to see the movie. The weekend featured Q-and-A’s; press junkets; a concert by Marc Lawrence’s son, Clyde, who scored the film; and a (modest) red carpet, all culminating in a screening of the movie followed by a Q-and-A with Marc Lawrence and Hugh Grant on Sunday afternoon in the Anderson Center’s Osterhout Concert Theater. The idea for a big local premiere came from Greg Delviscio, associate vice president for communications and marketing. Sunday’s screening may have been the only time Binghamton could see “The Rewrite” on a big screen for a few weeks, because the closest traditional movie theater it’ll be in is in Manhattan (it’s already available on-demand and on streaming services like iTunes). Depending on the movie’s box office success in the 10 theaters in which it’ll be premiering on Friday, the distributor, Image Entertainment, will decide whether or not it will put the movie in more theaters. For “The Rewrite Weekend,” as it was dubbed by President Harvey Stenger, the University didn’t hold anything back. On Saturday, a small audience mostly of theater and cinema majors participated in a Q-and-A with Marc and Clyde Lawrence, moderated by Tyler Downey, co-founder of the Binghamton Film Initiative and a senior double-majoring in theater and English. Later that night, in the Undergrounds, Clyde Lawrence played a concert of both original songs and covers with The Clyde Lawrence Band. Lawrence wasn’t shy to insert some wonderful pro-Binghamton propaganda lines into the film. Allison Janney’s character, an acerbic authority on Jane Austen and the above-mentioned ethics committee chair, proudly calls the University “the finest public university in the Northeast.” The name of a character named Flo Bai is pronounced “Flo bae,” a loving, perhaps-unintentional nod to a certain alumna who’s now a famous car insurance saleswoman. Lawrence’s script also gently teases the less-attractive parts of Binghamton — Michaels calls it “the absolute end of civilization.” Rain is constant, there’s little natural sunlight and there’s even a minor hazing scandal. 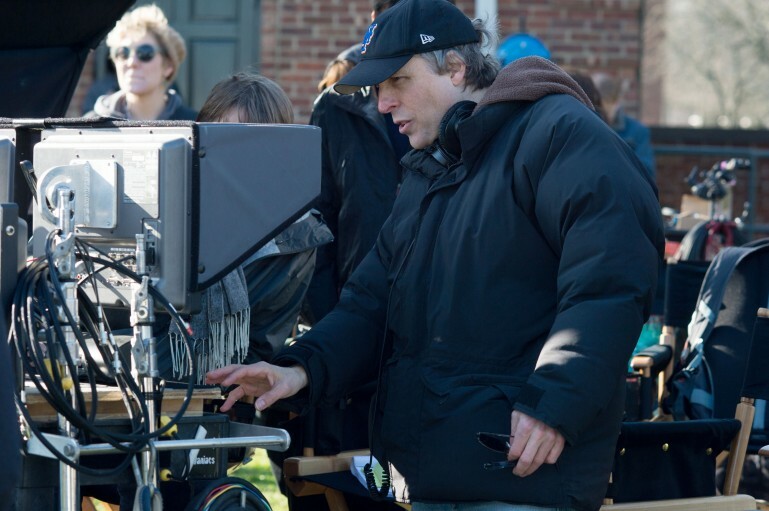 Marc Lawrence’s long path to writing and directing “The Rewrite” may have begun in 1981, the year he graduated from Binghamton University. Then he wrote his first script, “The World’s Most Famous House,” based on his experience living in a house on 130 Oak St. (now enjoying its afterlife as a parking lot). It got him an agent and, after a brief detour at law school for which he has few fond feelings, set him on a path to writing and directing movies as a career. From 1984 to 1989, Lawrence got his big break writing and producing “Family Ties,” a sitcom starring Michael J. Fox that became one of the defining shows of the Reagan Era. At Binghamton, Lawrence also found his wife, Linda, who graduated in 1983. Considering that “The Rewrite” is a romantic movie set in Binghamton, one wonders whether she has any fingerprints on the movie. Lawrence says that, in fact, Linda’s influence can be found throughout his work. Bullock was Grant and Lawrence’s matchmaker. She’s the one, Lawrence said, who wanted Grant to star in “Two Weeks Notice,” so Lawrence wrote the role for him. The two hit it off immediately. Since then, their careers have been inseparably intertwined. Of the four movies Lawrence directed since “Two Weeks Notice,” three have starred Grant, and all but two of the romantic comedies Grant has starred in since then have been written and directed by Lawrence. Grant has a reputation in Britain for being the “king of the romcom” in no small part thanks to Lawrence. Lawrence doesn’t write every script for Grant, but Grant’s usually interested in reading them, anyway. The hardest parts about making any movie, Lawrence says, are writing and casting. If actors are cast correctly, Lawrence said, they “know more about the part than you do.” Grant explores each of his characters thoroughly, and carefully considers every angle. In “The Rewrite,” Grant’s character, Keith Michaels, helps one of his students sell a script to a production company. At Binghamton, Lawrence didn’t have any experiences like that. After college, he spent a year at NYU’s law school before dropping out and trying to make it in the movie industry. “I’ve never taken a screenwriting class in my life, and I think it’s very apparent in my work,” Lawrence joked. Instead, Lawrence spent his days as an English major taking few notes, filling his notebooks with “lists of Beatles songs,” forming taxonomies of who sang which song, and when each song was made. “I was never planning to write,” Lawrence said. Then, after NYU, he decided he wanted to do something he loved and make movies like “Annie Hall,” which was one of his touchstones. “The world was so different back then. I didn’t know anyone who worked in show business, I didn’t know anyone who worked on a television show. There was no Internet, there was no access to scripts.” Now, anyone can learn about moviemaking by watching DVD special features, or finding PDFs of screenplays online. Lawrence lived on campus for two years, in Delaware Hall, before moving to Oak Street, and then Floral Avenue. While shooting at Binghamton, he pointed out familiar spots to the crew and told old college stories. This aspect, however, is what made Binghamton the perfect setting for “The Rewrite.” He didn’t want Keith Michaels to flee Hollywood in shame only to go to a busy city where he’d make the same mistakes. In a faraway place, where his reputation was radically different and no one knew him personally, Michaels could reevaluate his own priorities. 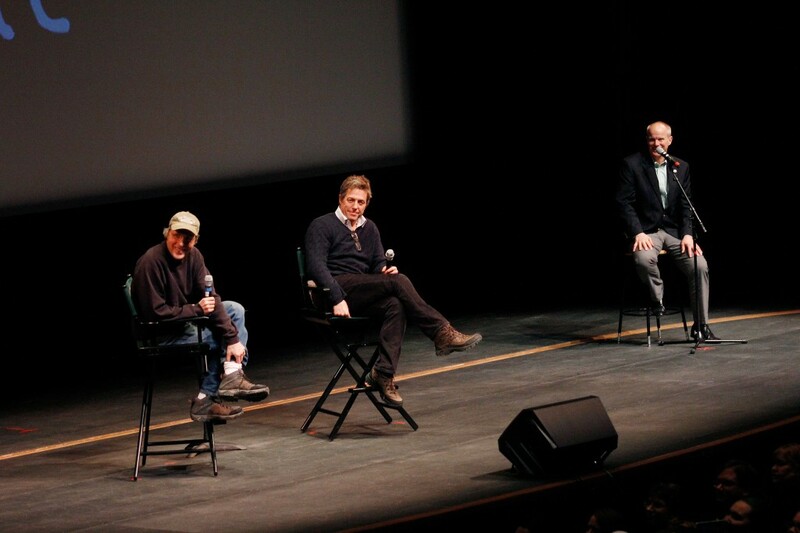 Binghamton’s obscurity wasn’t an issue for producers or financers, Lawrence said. As long as they liked the screenplay, they were willing to finance the film. He wrote about the setting mostly from memory, although he’s visited campus several times since graduating. Much of campus has changed since he spent his undergraduate years here. “I was wrong about some things — I had written into the script this grassy area where you could hang out and play guitars, and it’s now a loading dock,” he said. Lawrence has never been seriously interested in acting himself. He tried it once on the set of a movie he wrote, “The Out-of-Towners” (directed by Sam Weisman, who coincidentally grew up in Binghamton). Even with Steve Martin and Goldie Hawn in the scene, he said, he was scolded for being so bad that no one could take their eyes off of him. For Lawrence, making “The Rewrite” in the Southern Tier rushed memories of his past to the present, which made for some bizarre experiences. Lawrence recalled frequenting Johnson City’s Red Robin Diner in his undergraduate days. During filming, he went there with Grant. “It was a surreal, interesting experience that tied various aspects of my life together,” Lawrence said. “The Rewrite” is perhaps Lawrence’s most personal project, considering that Binghamton has had such an influence on him. On a personal level, too, he found visiting campus last weekend for the premiere an emotional experience. The most important film magazine in the world is called “Sight & Sound.” The first part, sight, is most obviously associated with movies — what we see onscreen. The other half, sound, is perhaps less remarked-upon but is equally essential. To score “The Rewrite,” Marc Lawrence hired his son, Clyde. “The Rewrite” was Clyde’s first full score, but Marc doesn’t believe he gave his son a big break. Clyde did it really well. The score is mostly piano-based, a sort of jazz-trio, Stevie Wonder and Randy Newman-influenced type of music, and is appropriate in scale for a movie set in Binghamton. There are different motifs for different times — a leitmotif for Marisa Tomei’s character, another for when Michaels is reading his students’ scripts. He composed the score with Cody Fitzgerald, a fellow senior at Brown University. 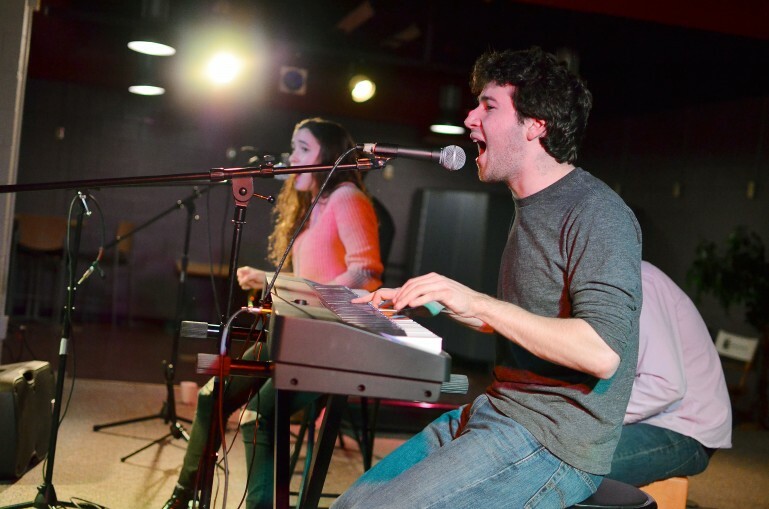 “Having heard him talk endlessly about his time in college and his time at Binghamton made it really easy for me to understand what feelings and tones to put in the music,” Clyde said. Marc and Clyde had a rapport, and they easily extended it to a working relationship. Clyde could easily see different cuts of the film from the editing room, and change his music as the film took shape. Marc and Clyde are ideal collaborators for another reason: They both know the vocabulary of music. While in Binghamton, Marc played in a band called Bondy. He knows the difference between a note and a chord, and could easily communicate the changes he wanted with his son. Marc’s parents also have a cameo in the movie. His mother plays “impatient Jewish woman in restaurant,” he said. Marc also sees his 11-year-old son, Linus, as a withering critic to whom he tells stories and who can sharply tell when a story doesn’t sound believable. Gracie, his 17-year-old daughter, is an actress, and also sings in The Clyde Lawrence Band. Marc has still never had a spiedie, and doesn’t really plan to. Nonetheless, “The Rewrite” is his love letter to Binghamton. Binghamton University has always tried to get itself on the map. It’s had some success, with a fine regional reputation as one of the best public schools in the Northeast, to be attended at a relatively excellent price. It’s also had no trouble attaching itself to some of its locale’s more idiosyncratic charms — the spiedies, the carousels, the birthplace of Rod Serling — which “The Rewrite” is happy to play up. “The Rewrite” will have a permanent place in the local mythos, but we won’t know if it’ll actually raise Binghamton’s national profile. There’s a scene in “The Rewrite” where Keith Michaels shows his students an episode of “The Twilight Zone” named “Walking Distance.” Lawrence picked that episode because he thought the characters reflected what Michaels was feeling at the time. “When you’re at a place in your life that you’re just looking back, and getting nostalgic and maybe over-romanticizing what’s behind you, it’s very, very difficult to turn around and look forward,” Lawrence said.